Ian Elliot was born in Glasgow in1946. Elliot's talent as a young Scottish artist was recognised at an early age. By the time he attended Glasgow School of Art in 1964, the young Ian Elliot had already won several medals for modern art scottish paintings. Like a many of todays successful Scottish contemporary artists, Ian Elliot, left the Glasgow Schoool of Art and took up a career teaching modern art. Elliot eventually became Head of Modern Art at a large Glasgow school. Then after some years Ian decided to focus full time on painting contemporary art. Since becoming a full time artist Ian Elliot has quickly established a reputation as a popular modern Scottish artist. In addition to Red Rag Modern Art Gallery in the Cotswolds, Ian's Scottish paintings are exhibited extensively at leading contemporary British Art galleries and galleries in Spain. Elliot's Scottish paintings are now avidly collected in the UK, Eire, Germany, Spain, Canada and the USA. 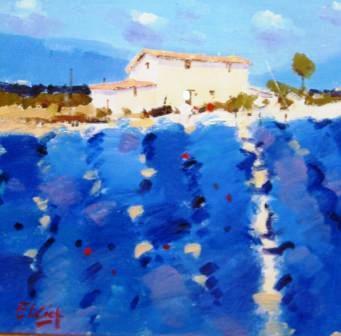 In 2003 Ian Elliot was a finalist of International Artist magazine for his Landscape painting.